For over a decade, the Mystery Dinner has been the Library's signature annual fundraising event. 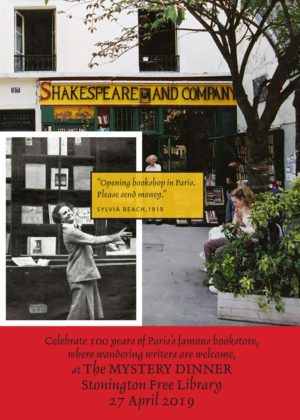 This year's event is inspired by Paris's favorite book store - Shakespeare and Company. The event sells out each year, so get your tickets early!! To reserve your place, stop by the library to purchase your tickets. For more information 860.535.0658 or development@stoningtonfreelibrary.org.